I recently visited the Lincoln Museum in Springfield, IL, with my family. One of the many exhibits that caught my eye is called “What Are They Wearing in Washington?” Front and center is Mary Lincoln, with her dressmaker Elizabeth Keckly helping her into one of the sumptuous ballgowns popular during the Civil War era. Abraham Lincoln Presidential Library and Museum, Springfield, IL. As I approached, I flashed on an ever-popular exhibit at the Smithsonian Institution in Washington, DC. Growing up in Maryland, I was lucky enough to visit the Smithsonian several times as a child, and I loved seeing the First Ladies’ Gowns. The oldest belonged to Martha Washington. 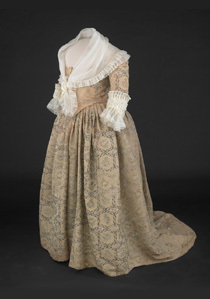 The Smithsonian collection, originally called “Collection of Period Costumes,” officially began in 1912. Volunteer curators began collecting gowns worn by former first ladies, and created the first collection focused on women. By 1931 a gown had been collected to represent each presidential wife or hostess, and in 1955, a curator created a new “First Ladies Hall” exhibit. Gowns were presented within period rooms. The Smithsonian asks each First Lady to donate a gown to their collection. 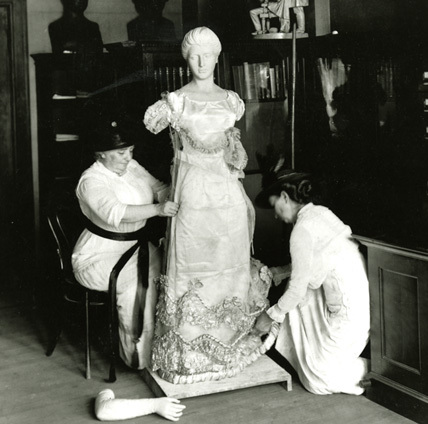 Helen Taft donated her inaugural ball gown in 1909, starting a trend that continues to this day. Back to the gowns on display at the Lincoln Museum. They are reproductions—gorgeously done, but without the magic of an original. However, exhibit designers used those reproductions to superb effect. 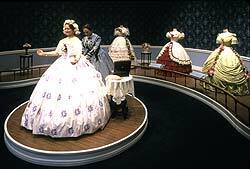 Mannequins are arranged in a semi-circle around Mary Todd Lincoln to represent some of Mary Lincoln’s social rivals, the Washington elite. A short paragraph introduces each woman, and includes a quotation that criticized or ridiculed Mary. 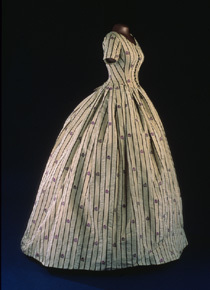 Young visitors might simply delight in the sumptuous fashions, as I did way back when at the Smithsonian. Older guests will leave the Lincoln exhibit with a new appreciation of Mary’s position at the center of a storm of public contempt. There are lots of ways to present historical stories. Some touch the mind, and some the heart. The best manage to do both.